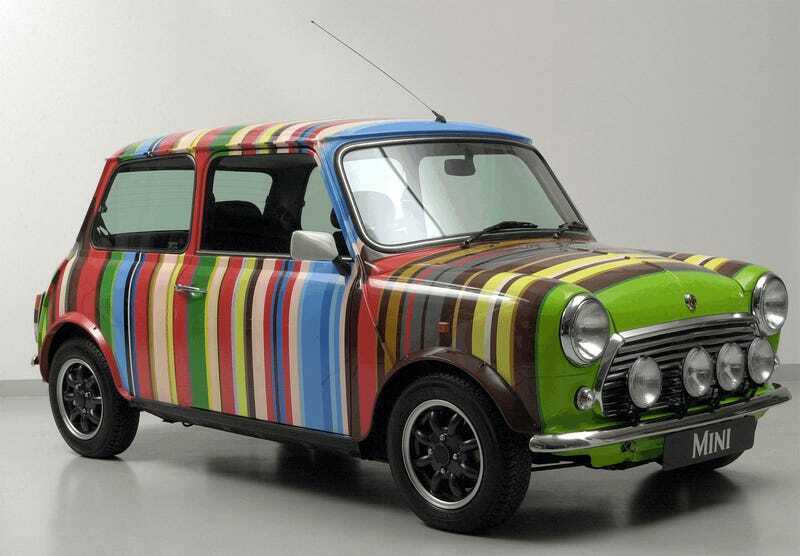 Back in 1999, Mini asked three British icons to come up with their own Mini designs for an upcoming exhibition celebrating the brand’s 40th anniversary. David Bowie was one of them. The car was good, but his remarks about the project stole the show. The other two participants were fashion superstar Kate Moss and fashion superstar Paul Smith, and the Minis they came up with looked like this. You can probably guess who designed the one with only white lines. Bowie was responsible for that mirrored concept that’s been making the rounds again since his death from cancer at age 69 a few days ago. As far as I know, although the Art Car trio was created to land at the London Design Museum’s exhibition in February 1999, they were made ready as early as in October 1998. This was so the cars could hit the stage at the now-cancelled British International Motor Show in Birmingham as well, alongside such celebrities as a young Vicki Butler-Henderson. According to Automotive News’ archives, the 1998 show was made famous by former BMW boss Bernd Pischetsrieder’s unexpected press conference, where not long after launching the new Rover 75, he started to complain about the poor productivity at Rover’s Longbridge plant. Less than two years later, BMW split up the Rover Group, selling Land Rover to Ford but keeping Mini. The first BMW-designed Mini Hatch hit the market in 2001. Why do you think Mini design has lasted so long? Do you have any other favourite British design classics? 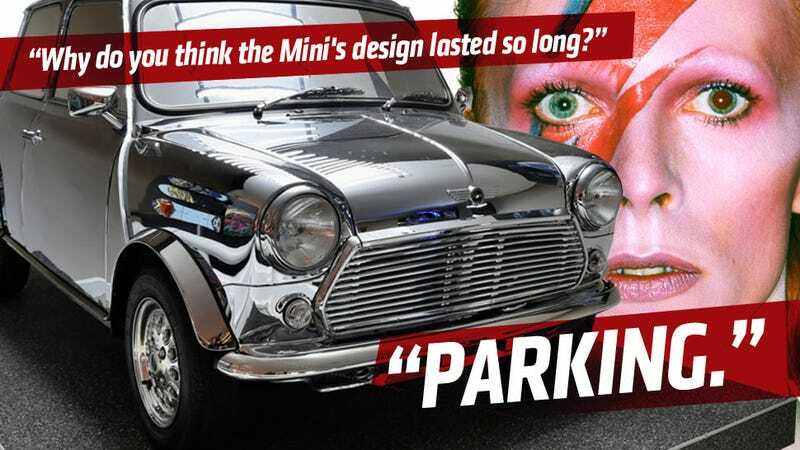 Today, the Bowie Mini resides at the BMW Museum in Munich. In case you’re wondering what the 1999 David Bowie looked like not long after joking around with those folks at BMW, I highly recommend listening to ‘The Pretty Things Are Going To Hell’. Lemmy Kilmister, David Bowie, Alan Rickman, rest in peace while we deal with the fact that Bernie Ecclestone is still with us. Photo credit and massive hat tip to BMW Classics. Additional thanks to Jason Torchinsky!